Well, yarst! I learned in library school that the “real title” of a book is what it says on the title page. 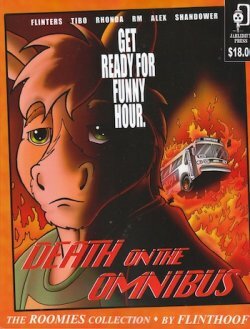 Death on the Omnibus is just what it says on the cover, and the title page says only, “The ROOMIES Omnibus”. What’s an ex-librarian to do? This is the big (8 ½” x 11”) complete collection of all of Flinthoof’s humorous Internet comic strip, Roomies, at four strips per page. It contains all 1,200+ strips, from May 31, 1999 to November 21, 2008; plus a new story just for this edition, a new Introduction by Tibo, and thoughts by Flinthoof three years later on having drawn Roomies. Well, not COMPLETE. 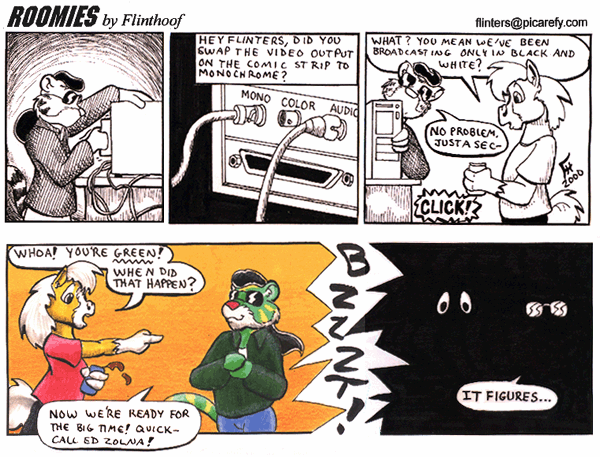 There were occasional Roomies guest strips by other Furry cartoonists over the 9+ years, notably Seattle’s Sheryl Schopfer of the Deer Me webstrip, as well as a few non-continuity strips and full-page art by Flinthoof himself. This collection jettisons some of this extra material, retaining mostly what has been designed into the basic story line. For the complete Roomies, see its website & archives. You will still want Death on the Omnibus for its new material. Death on the Omnibus replaces Jarlidium Press’s four earlier collections of about 270 strips each: Roomies: Blue Screen of Death, Roomies: Death from Above, Roomies: Death on Toast, and Roomies: Death and Taxes, which debuted in January of 2004, 2005, 2007, and 2009 at those years’ Further Confusions. Those were $8.00 or $10.00 each, so $18.00 for the complete run is a bargain. This omnibus keeps the introductions to the four individual volumes, which help document the evolution of the strip. In fact, Death on the Omnibus is more a compendium of the four earlier collections than a separate collection of the online strip. Roomies was a very popular black-&-white Furry strip during its 9+-year run. It got onto the ALAA’s Recommended Anthropomorphic Reading List in 2001, 2004, 2005, 2006, and 2007. It was very ingroup/refential to Furry fandom. Flinthoof Ponypal (“Flinters”) and his roommate Tibo, are both comic strip protagonists as a Palomino pony computer technician and a green tiger (with yellow stripes) computer programmer, and in real life as techie/cartoonist Dan Canaan and programmer James Birdsell, prominent Seattle-area Furry fans (Tibo created the ConiFur Northwest convention) and the editors of Jarlidium Press. There are ingroup references to the ConFurences, to Oren Otter’s The Changing Workplace and Tymn Eaveranth’s Boomer Express webstrips, to Ed Zolna’s pioneering Mailbox Books Furry-specialty bookseller, and other aspects of the late 1990s Furry-fan community. There are also Roomies guest appearances by the Furry persona of notable fans who visit Seattle or whom they encounter at Furry conventions, and a long-running plot crossover with Tiffany Ross’s The Cyantian Chronicles. The strip focuses upon the fantasy-exaggerated sitcom life of the two Pacific Northwest bachelor nerds and their friends. Flinthoof is naïve, addicted to mints, and likes to tinker with cars, while Tibo crowds out their home with obsolete computer parts. Borg, Tibo’s sentient home computer, is insultingly smarter than they are. Their pet ferrets are sidetracked from taking over the world only by their lust for Cheesies and shiny objects. After two years, the day-to-day gag strip begins to develop longer continuities and a supporting cast. Rhonda Lepus, an online investment counselor, moves into the neighborhood and becomes Tibo’s girlfriend. (“Bhuuunny!”) Rhonda’s elderly mother, RM (Rhonda’s Mom) Lepus, comes to live with her and run everybody’s lives. (“Why don’t I have any grandkids yet? Whoever heard of a tiger-bunny relationship? Are you sure you wouldn’t be happier with your own kind?”) More anthropomorphized computer-oriented friends of the roomies drift into the strip; notably Shandower the mercenary cat (who also appears in Seattle cartoonist Sheryl Schopfer’s Deer Me webstrip as the Furry persona of Schopfer’s boyfriend), Virus the studly red fox, and Corey the kangaroo video game designer. I haven't shut it down for any other reason than it was time to do so. Too many other webcomics keep going long after they stopped being funny (Kevin and Kell) or should have been shut down years previously. I didn't want ROOMIES to go on as a shadow of its former self. It's been a fun ride but it's time for it to end while it is 'on top' so to speak. Canaan followed up Roomies in 2009 with the new Scavengers, a more serious Furry deep-space s-f strip that only lasted about three months as a full-page webstrip before turning into a non-web traditional comic book (#1, #2). Most recently, he has reactivated the Roomies site in July 2011 to post a full page, full color sample and to say that he was seriously considering restarting the strip in this format. Let’s hope that he does. Internet Furry webstrips have proliferated since the 1990s. Most follow Sturgeon’s Law that 90% of everything is crud, and soon disappear. Also, webstrips tend to be created by older teens and college students with both enthusiasm and time on their hands. As the creator gets older, the enthusiasm and creativity run out and the free time disappears; the strip disappears after a few years. That is what Flinthoof was afraid was happening to Roomies, and why he neatly wrapped up the strip instead of just dropping it. It’s always reassuring to see the best and most popular of the Furry webstrips archived in currently-available collections. Roomies was one of these, both enjoyable as fantasy-humor and as a time capsule of the Furry community in the early 2000s. Get Death on the Omnibus! Flinthoof has also made several appearances in West Corner Of the Park. As a Brit, I sometimes missed cultural references in the comic; in particular I thought Altoids were something made up for the character, or FurryMUCK. After all, alt.fan.furry was still well-known back then, and I figured it was just a reference to that instead . . . But Altoids ARE British! However, according to Wikipedia, "Altoids are less widely available in Britain—their country of origin—than in the regions to which they are exported, the standard peppermint mints being the only flavour available and only stocked in relatively few stores. They have never been heavily marketed in the UK unlike they have in the USA. Callard & Bowser-Suchard formerly manufactured and produced Altoids at a plant in Bridgend, Wales, but Wrigley, the brand's owner, moved Altoids' production to an existing plant in Chattanooga, Tennessee, in order to manufacture its products closer to where they are primarily marketed." Indeed! I might have seen them before, but they were not a brand I recognized, let alone as a British invention.